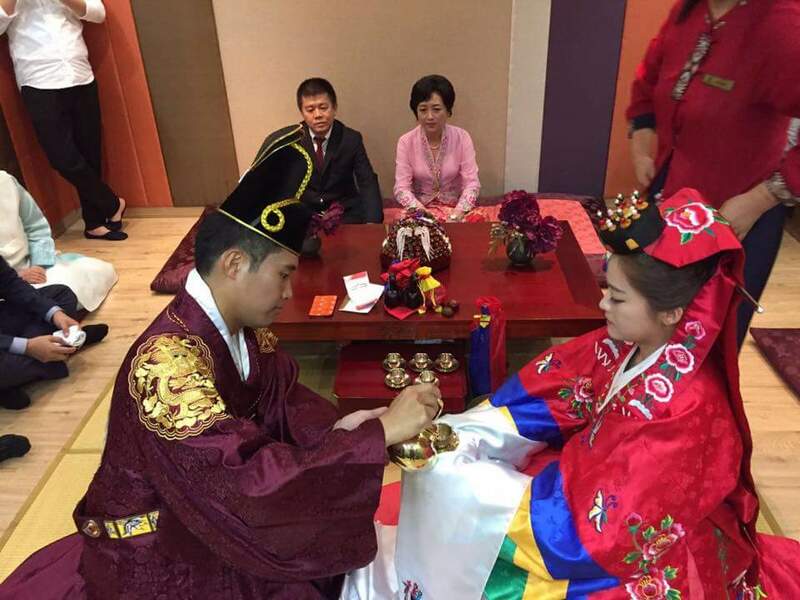 Our Korean wedding was held on 8th October 2016. 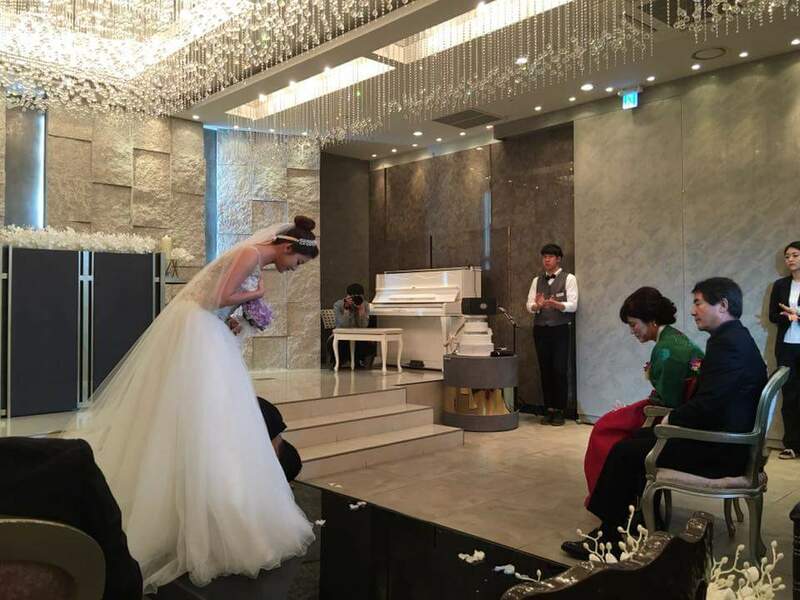 It was a beautiful experience and i really like the wedding concerige services in Korea. The room where i tried my gown few days before the actual day. Because i only arrived a few days before my wedding date , i only have few dresses to choose from so we decided to upgrade the dresses to premium range which just got featured on a wedding show and im the first to wear it ! YAY ! Their make up skill is really..wahhhh …it lasted the whole day and skin still looks dewy and natural. All done with sponges and no brushes even for eyeshadows. 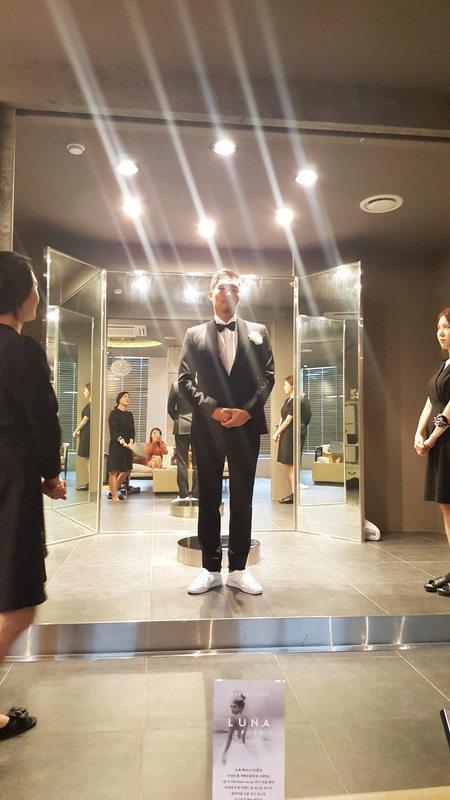 The groom choosing his tuxedo. The service is very bride focus. So the groom one was chop chop and done. 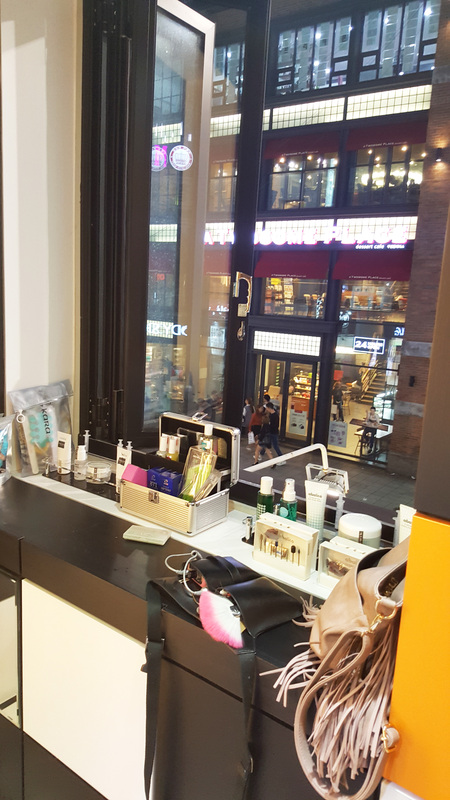 Also before my wedding day , i went to my favourite shopping place Seomyeon to do my nails. Very shiok. Because i do not need to lift my feet or arm. The lady just press a button and is automated. I rest my arm on a cushioned arm rest and she press a button to lift my arm at a comfortable angle. I just fell asleep there. They also served me some tidbits and drinks and fruits. Shiok. I cannot remember the name of the place but if im not wrong it is Nail Gallery. Quite big and is 3 storey high because they also do lash extensions etc. But don’t expect cheap price because the service is good. Plus few mins of foot massage. lol. 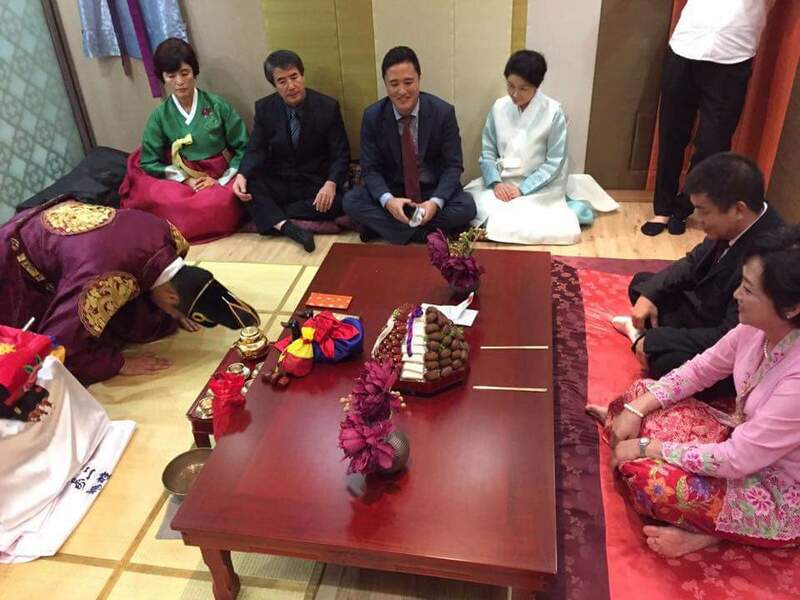 My Singapore relatives and parents can for my wedding. 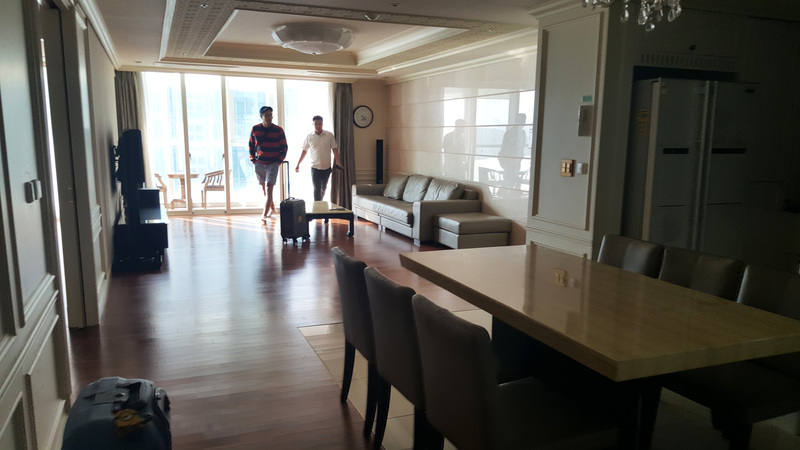 So we rented an apartment facing Haeundae beach. 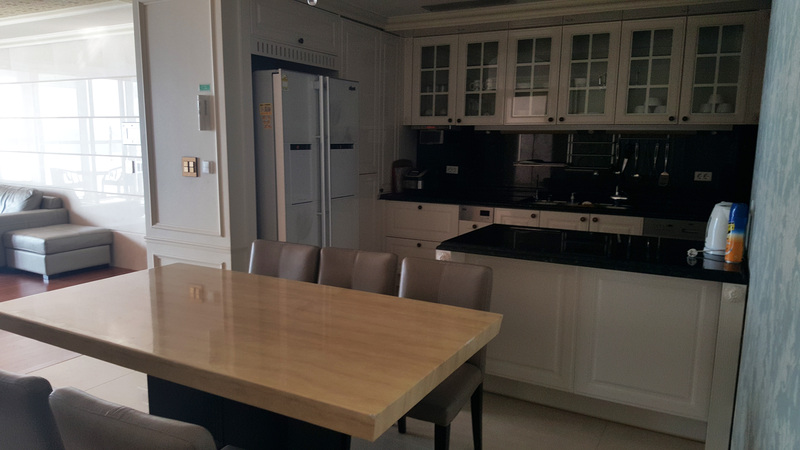 3 bedrooms enough for 9 to 11 pax with big kitchen , rooms , toilets and living room with beach view balcony. All together was only $1000 for a week stay. Drinks , laundry room etc all included so it is very comfortable like living in your own home. The place is really bigggggg…can play catch with my dog there if she is there lol. 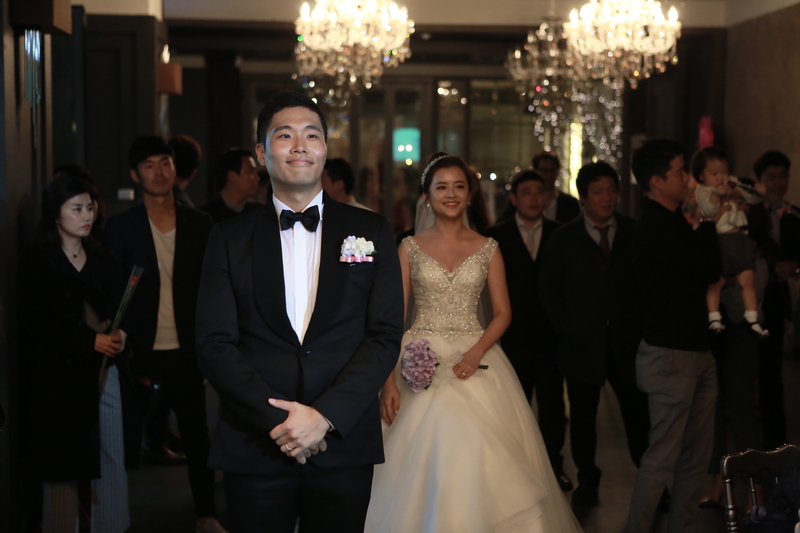 And then it was our wedding on 8th Oct.
Our wedding was exceptionally long..took 2 hours and usually Korean weddings only take about 30 mins to an hour at most. 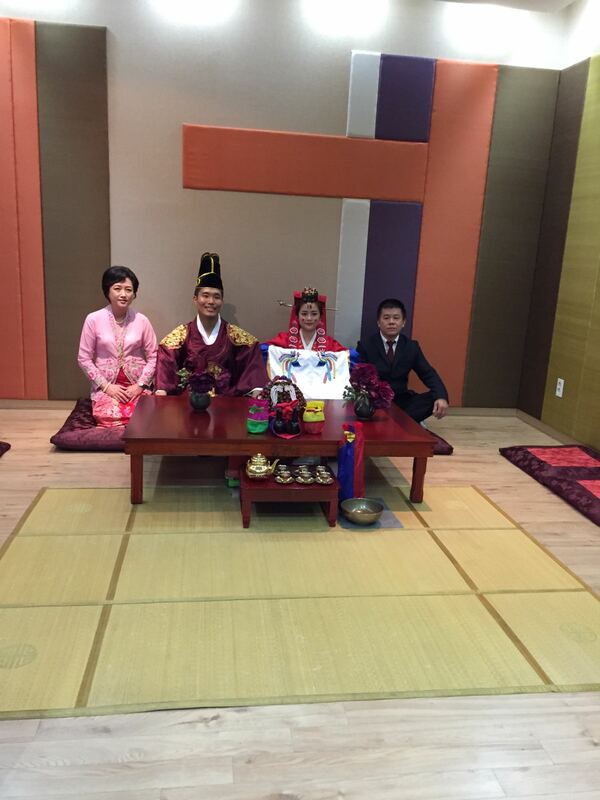 We did abit of SG and KR fushion but still keeping the Korean tradition. The only tweak was we added 2 video segments. 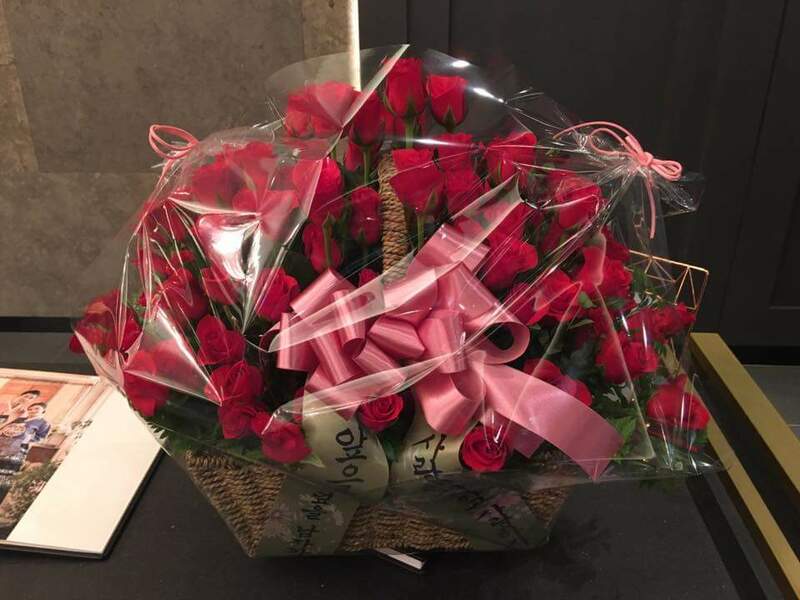 And he also performed an event for me ( Singing his favourite Yue Liang Dai Biao Wo De Xing song and getting his friends to give me roses one by one ) . Been together for 3 years and this is the first time i received flowers from him..haha our wedding day. 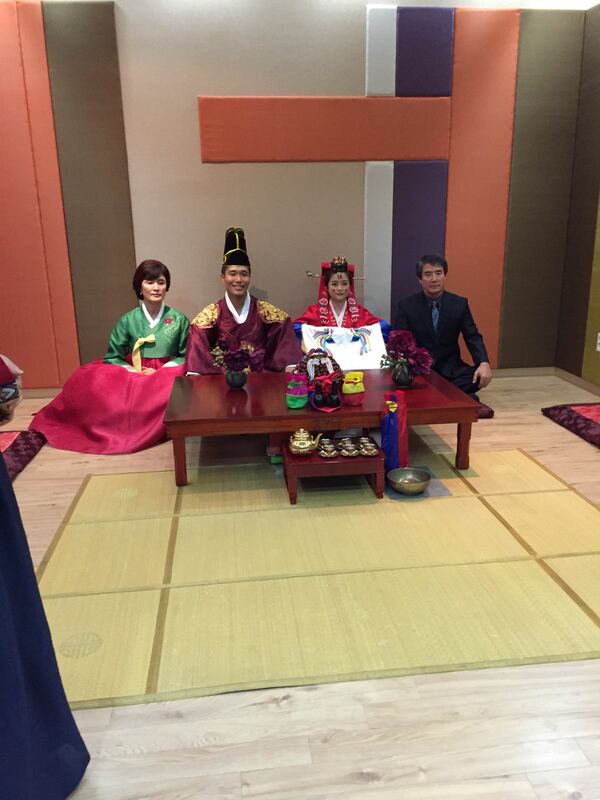 Here are photos taken by my guests. My father-in-law passed away 15 years ago from heart attack in his sleep. So my father-in-law’s brother took his place during the ceremony. 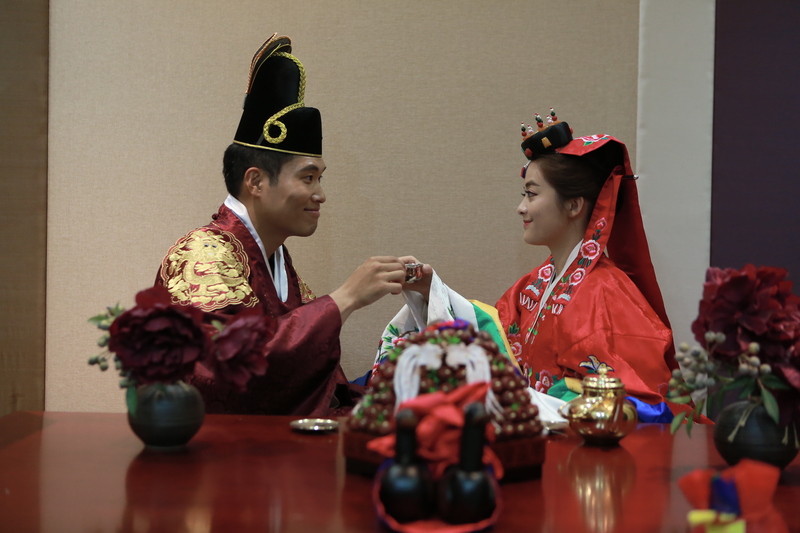 From today , let’s live happily ever after as Husband and Wife…with alot of naggings , teasing and laughters ! Now need to work hard for our future and have our own mini RJ and mini PL. So July to October was 3 busy months for us. Finally , all are done. I will be back to updating this little humble blog of mine often. 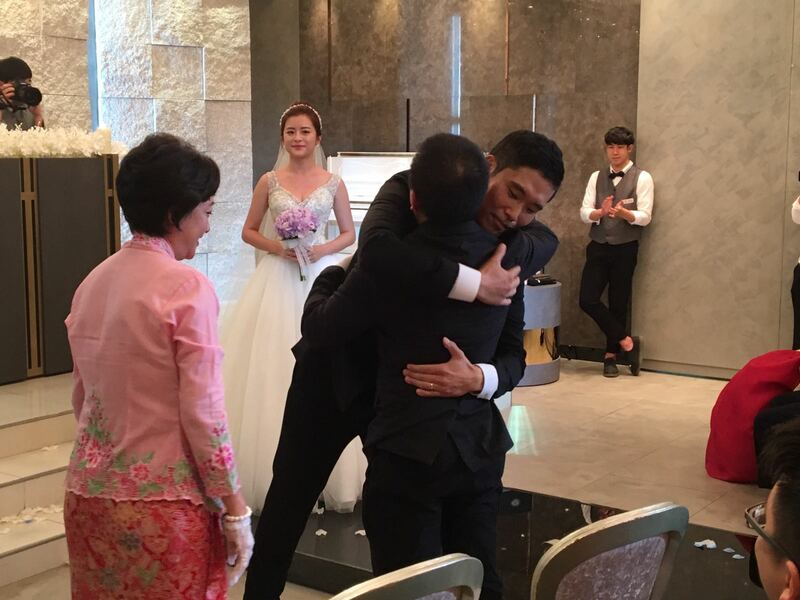 We are now officially husband and wife in Singapore and Korea (still processing our marriage registration). There are so many things i want to share with everyone..my first milestone in my career , my wedding , Korean food recipes from my mother-in-law , Korean make ups and skincare which i just bought ( reviews !!!! 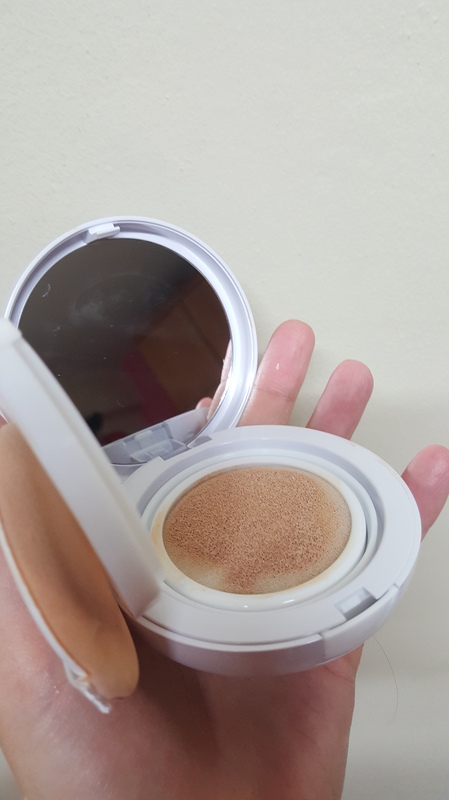 i really bought alot this time and revamped what’s inside my make up pouch ). But before i go on and start bombarding this blog site with all the things i want to share , i need to clear up some work for my clients and also prepare and gathering documents for our Korea marriage registration with Korean embassy in Singapore and also documents for me to apply the spouse visa in Korea. Here is a video taken by Tommy Fok (my cousin’s husband) from Framewerks ( https://www.facebook.com/Framewerks.Photography/ ) . The reason why we engaged their service was because we find their videos very unique. Tommy met up with us and note down our story so that he can plan the shoot. Very different from the rest and instead of the usual gate crashing video scenes etc , the focus is more on our story. How we met , how we feel , what difficulties did we face and how we overcame it. 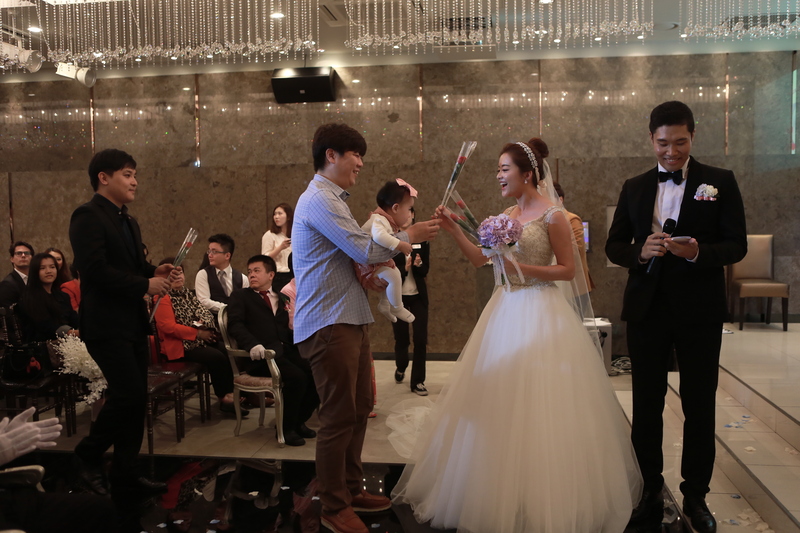 Instead of shooting a wedding video , it is more about our story. Something i can show my kids infuture. 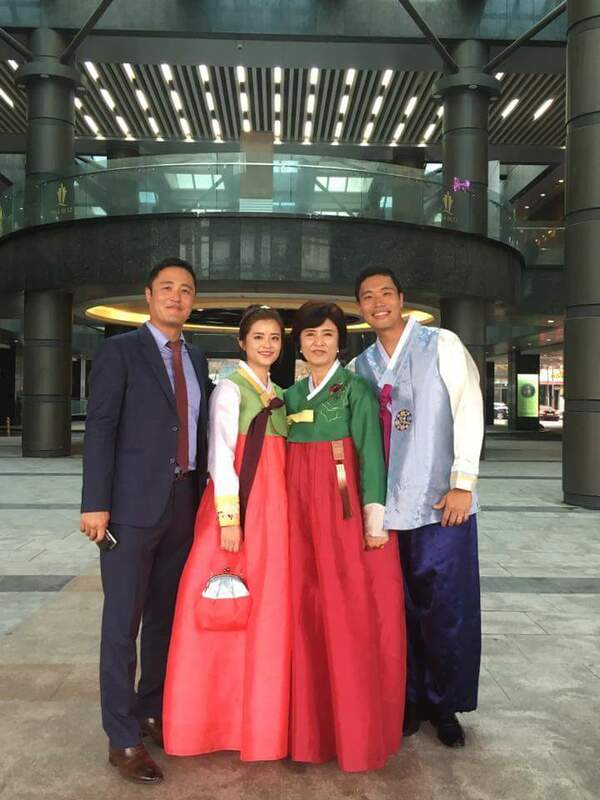 How their mom and dad met and how they overcame all the cultural and language barriers when they first met. And if we ever face any difficulties in our marriage , this video can serve as a reminder and memories of the good times we had together. To be honest , after watching this video ( over 20 times ) , it indeed brought us closer. There are somethings he never said to me before but he did infront of this video because he wants those words to encourage me and help me if i face any challenges in life. Thank you Tommy for this wonderful video. 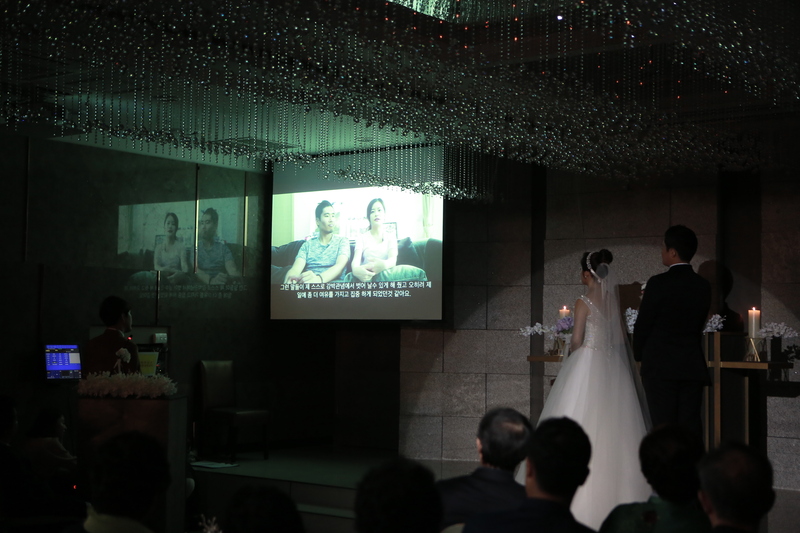 It is our own Korean drama story video. Our ROM in HortPark , Singapore. A tip of you want to do outdoor or garden ROM ceremony like mine. Make sure you got no “feeler” fringe and bring along a portable fan. Wahhhh the weather was really damn hot…i can feel the sweat beads trickle down my back in my cheongsam. And my hair all went flat and fringe was stuck to the side of my face. 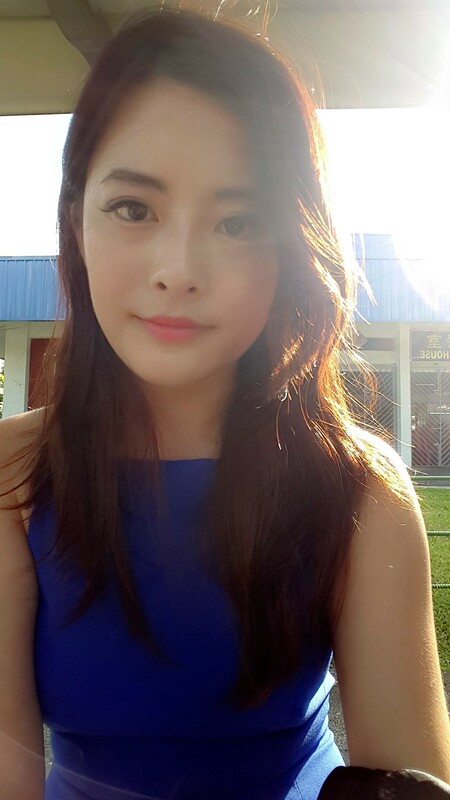 My make up also melted under the heat. Temperature was 32 degrees. Heng ah..i bought plastic fans as one of the wedding favours. 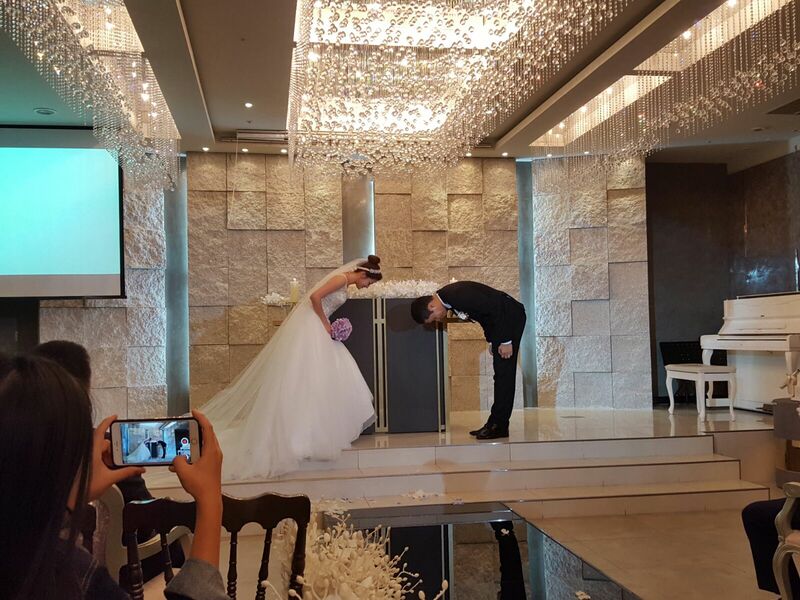 You can see my guests fanning themselves hard with the fans lol. 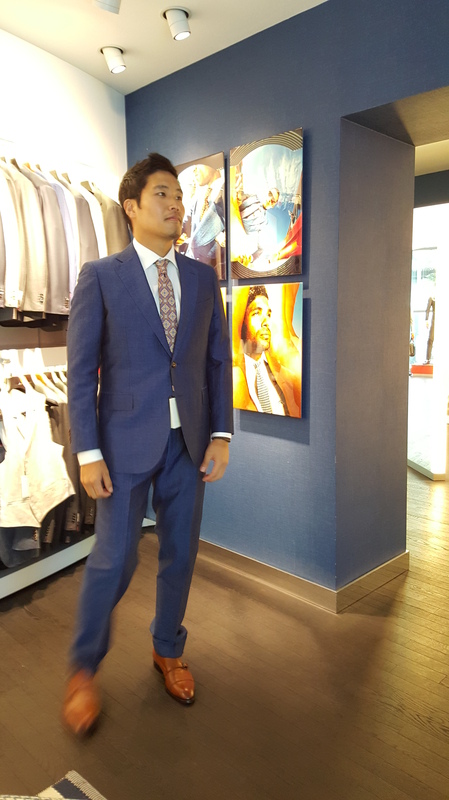 My hubby wore the suit the whole day under the hot weather and he ended up having fever the next day. Don’t know if it is heatstroke or what. His shirt and suit was wet inside because of the heat. 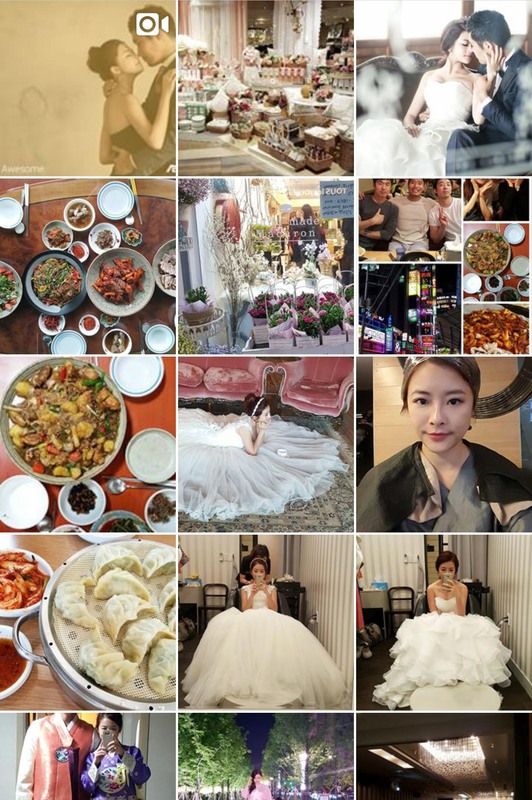 Also , try to diet abit before wedding/video/photoshoots if you want to look good. Mr Shin said i should gain more weight because i looked really pale after i tried to diet 1 month before our video shoot. So i started eating alot 2 weeks before our ROM in Singapore and i looked so much plumper in the videos lol. 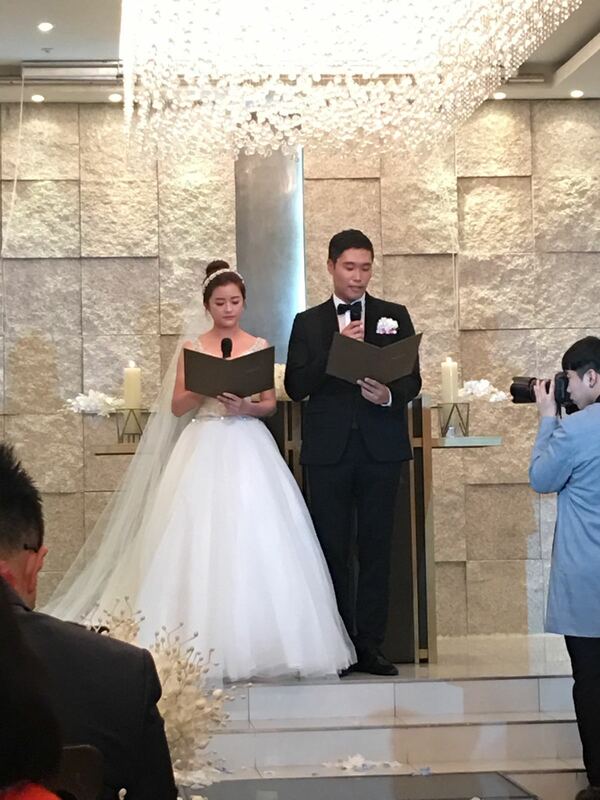 So i learnt my lesson liao….i went on a no-carbohydrate diet for 2 weeks before my Korean wedding in Oct. I never had rice for 2 weeks. Lol. It works though. 2 more months to our ROM in SG and 3 more months to our ROM in Korea. Time really flies. Been very busy lately and my meal timing were kinda screwed. Last week was a packed with full of meetings , meeting new people and also preparing for the big day ( final discussion for the ROM in SG ). Everything is sort of settled thanks for recommendations from friends. And also i am addicted to scrolling Taobao right now. Alot of wedding decors and ornaments that are so cheap and nice. Instead of renting , i can buy them at $5 , use them for my ROM and bring home to decorate my place. They even have the cutest guest book at $6. 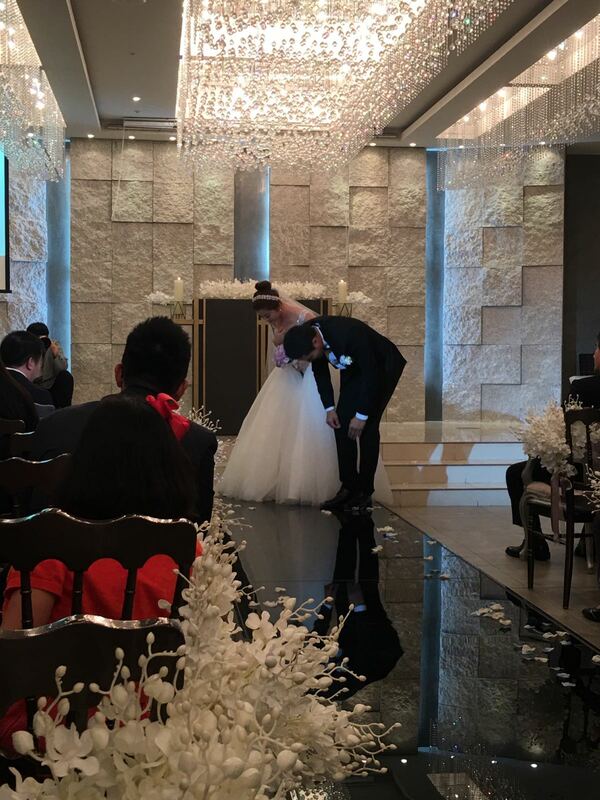 And i just chanced upon another wedding song which i really like. Was thinking of using this for march-in song and the other song by Huk-Gak to be sung by my bro-in-law’s friend who is our live band. This is my tentative choice for march-in song . My MUA was settled. Wendy from Lushlashh will be my make up artist and also having my lashes done at Lushlashh. I really like her work and patience. The lashes she did for me are always so natural. 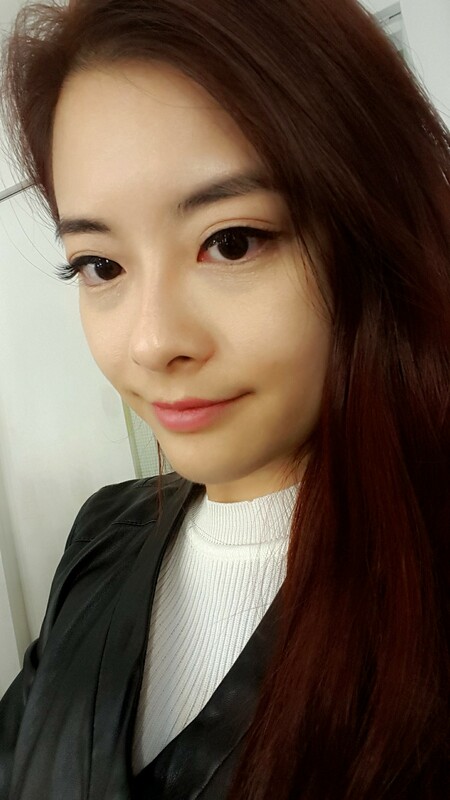 I always go for K-style lashes which was supposed to be “no-make-up-or-lash-extensions look” . There is a vast difference between Kstyle lashes and Jap style lashes. Japanese one are more vavavoom and glamourous looking. But it doesn’t suit me and i don’t like to look too over. The lashes Wendy did for me are so natural that some people i spoke to asked if they are my real lashes or i had extensions done. They cannot see the difference when they look at me face to face. But from the side view , you can see that it is longer. Im not sure what kind curls i go for because i ask her to replicate the one i did in Korea. She has my details. So if you want the natural looking K-lashes , just tell her you read my blog and wanted the same set as mine. 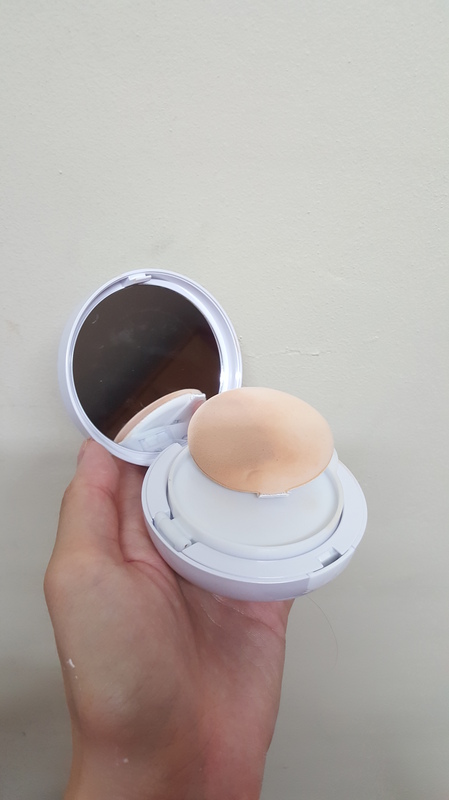 If you are worried that if it will look too natural as if you have nothing on and you think it is “waste of money” ? You don’t need to worry about it because you can see a difference before and after. Btw i also always go for one which make my eyes look like im wearing an eyeliner when i am not. Anyways , she has my history and data. You can tell her that you want the lashes that Peiling did. Lushlashh is located at level 2 of Arcade Shopping Centre at Raffles Place. Here are some of the lash extensions i have done. And as for my hair , Joanne at Hair Affairs Chevron House will dye for me . I went to her before my Pre-wedding shoot trip to get my hair dyed to a nice violet red colour. It looks sooo nice and my MIL also said it was a good choice of colour. My readers will get some discounts if you mention my name. Btw , i paid for these services and these are not adverts. If you read my blog long enough , i have stopped doing adverts for 2-3 years and all are based on my persona experiences and reviews. Anyway you have to call to book appointment. She starts work as early as 8am. I went at 8am before and the salon was filled with bankers and tai tais who wake up early to wash and curl their hair to prepare for work at 9am. I don’t think i will do that man. I would rather sleep more. She has been in the line for more than 30 years and her banker clients followed her for more than 20 years. Here are some hair inspirations i have got. I am tempted to my dye my hair again before my trip to Korea for my wedding. I wanted to do this kind of curls. But because at that time my hair was badly damaged and i really want to have healthier hair so that i can perm in October in Korea…plus my recent diving trip made my hair worst…soooo…. I went to find Joanne to cut all the bad split ends off and now i have shoulder length hair. Hair ends are healthier now and easier to manage. So now i just need to wait for it to grow, maintain my hair …then hopefully i can perm. I cooked Carbonara Ramyeon on sat night. Oppa is away for biz trip in Europe and back only next week. I wanted to cook Andong Jjimddak but it will be too much for one person to eat. So , it is Carbonara Ramyeon for tonight. 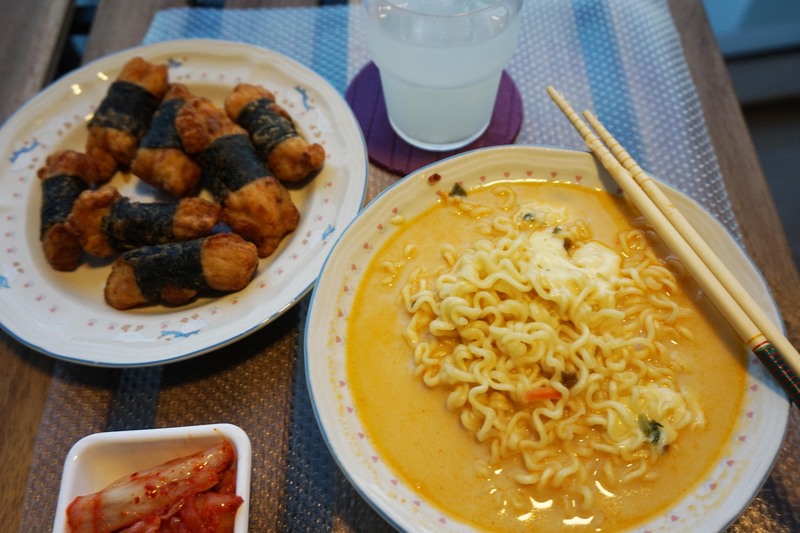 Korea is an instant food heaven. Alot of instant food and some are claimed to be healthy choice. Well …my bro-in-law never uses the seasoning packs. 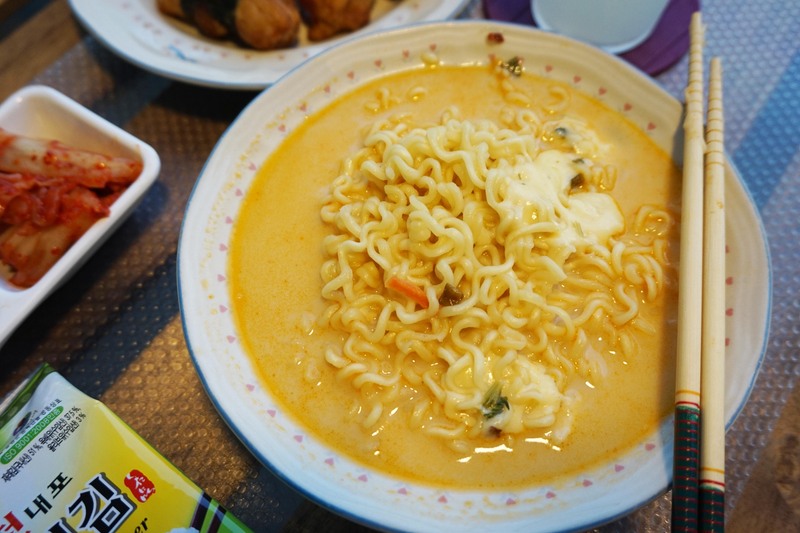 He used the Korean shrimp sauce, pepper flakes and soya sauce to make his own ramyeon seasoning. Healthier this way because msg in the seasoning packs are not really good for health. 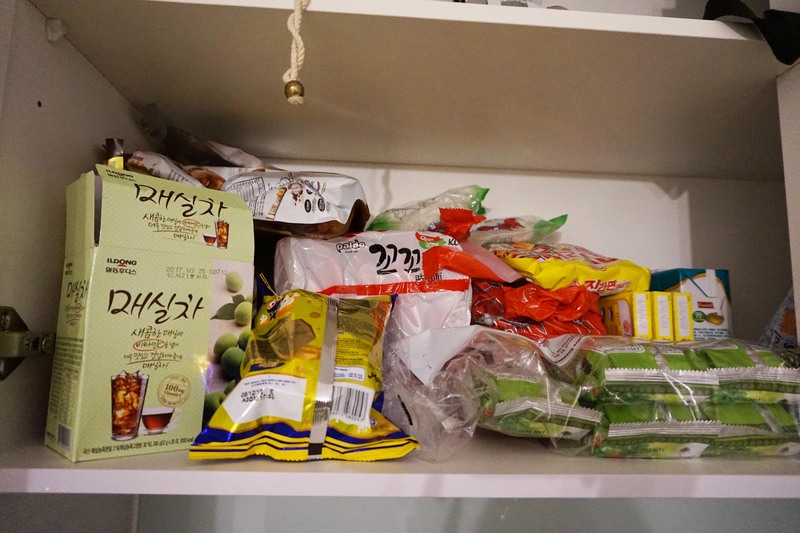 This is something i want to learn from him when he comes in Sept.
My kitchen cupboard with instant noodles. Something i don’t really like and only cook if i got no choice or too lazy to go out to buy food. Here is the recipe. 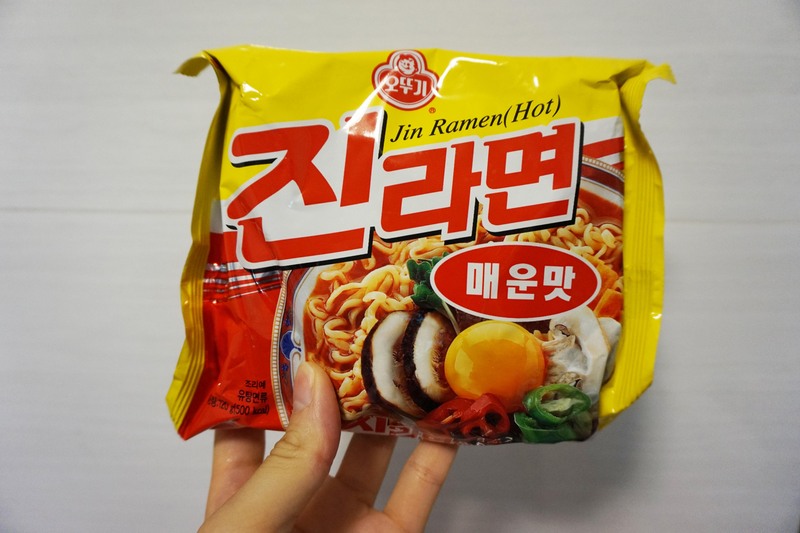 To be honest , it is recommended to use SHIN Rammyeon. But i was too lazy to walk 10 mins out just to buy a packet of ramen so i used whatever is the closest to Shin Ramyeon that i had at home. 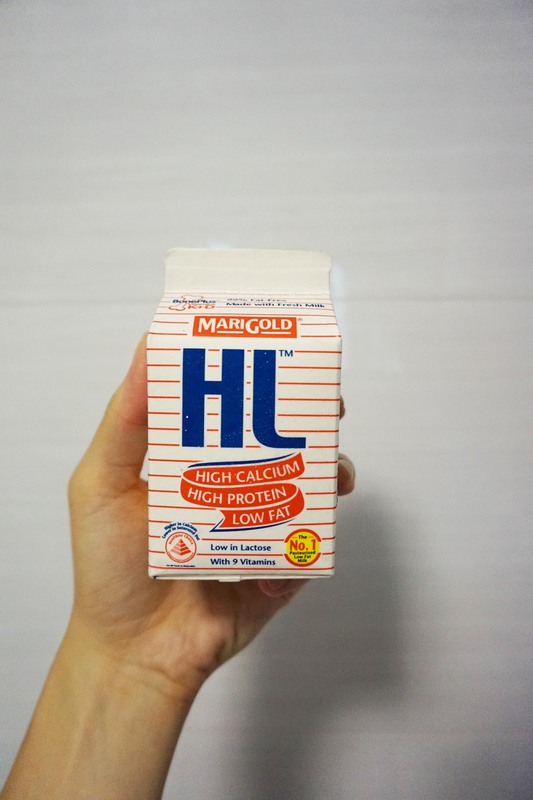 1 pack of Hi-Lo low fat milk (200ml). Boil 400ml of water at high heat. If you do not have a measuring cup , empty the milk from the carton into a cup and use the empty carton to fill with water to measure since the milk carton is 200ml. Once the water boiled , add in the ramyeon and the seasoning packs for about 3 minutes. Add the entire pack of 200ml of hi-lo milk. 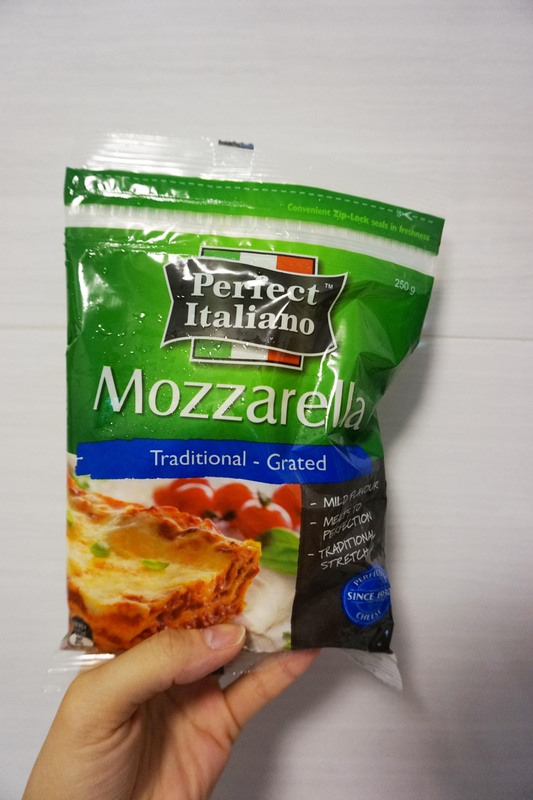 Let it boil for 2 minutes and add a handful of mozzarella cheese. How much cheese you want is up to you. 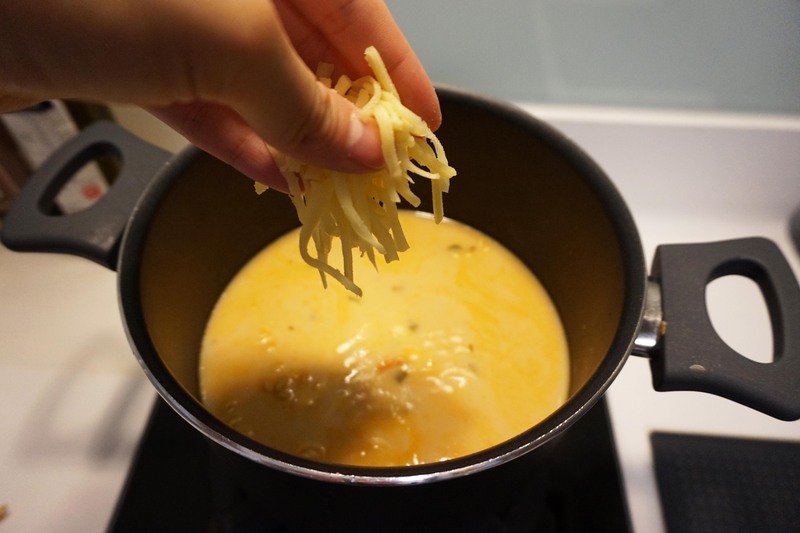 I like cheese and like my noodles to be slightly sticky with cheese so i added ALOT. Stir. Once done , you can serve it in a bowl. Easy and shiok ! I paired with seaweed chicken seaweed and Kimchi ! Oh and a cup of cold Yuzu drink. Hope you enjoyed it. Very simple. Just need 15 minutes and you get Carbonara Ramyeon. Now that we are living on our own , which means alot of bills and groceries to do. For Oppa, he has been living on his own for years but for me this is the first time i moved out. I paid utilities and bills at my own home but now that i moved out , there are more to pay. Being a financial planner and a financial planner in our house , i am in charge of the utilities and expenses. I record and keep receipts and limit groceries shopping to $50 a week. I have been buying so many things from Korea websites and mart now that i find buying all the necessities in SG are so expensive. When i travel to Korea , i will buy everything there and bring over. Now that we need some things urgently and i went to the supermarkets to buy and got shock at the price. In Korea i can buy 3 good shampoos for $10 and here 1 good one for more than $10. My work schedules are pretty tight. I start my day early and ended my day late which means that i can’t go to local market in the day time and so i depended alot on 24hr supermarkets. You must be wondering why now then i realized that things are expensive in SG. Not that i now then realized , i realized it long ago but just that im not used to buying my daily necessities in SG yet except for food. Here was what i got from Gmarket. Yes whatever number of sanitary pads here you see is just 10,900won which is about SGD 13. If you have used Korean pads before you will know the difference. Some of my friends even asked me to buy a carton for them and ship to SG for them when im in Korea. They are made of cotton and really damn comfy. Better than those nylon netting ones that are commonly used. I think these 2 “towers” of pads can last me 2 years i guess. Some people said im getting to “ahjumma” ..because i cooked , i cleaned my own house and i do grocery shopping. Those who said that are mostly singles. 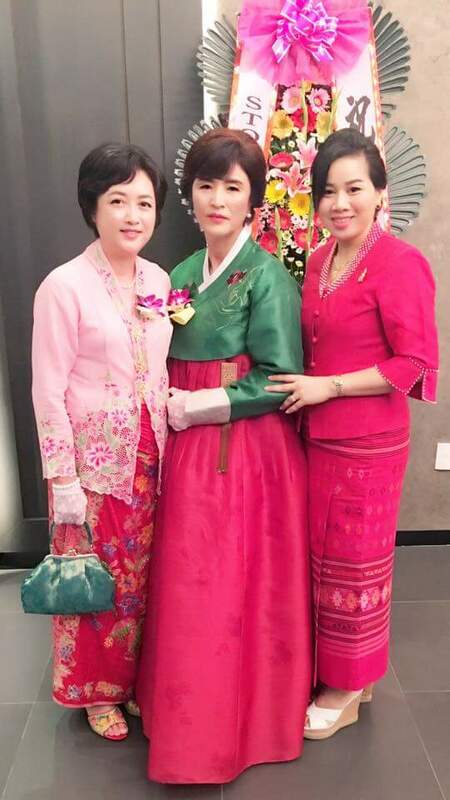 Married women i met and know and are working mums or wives like me do not agree that we are “ahjumma” just because we are more careful with how we spend and just because we clean the house and not hiring a maid to do so and go to the markets to do grocery shopping. This is our responsibility as a wife. Even though we are working and we can afford to spend doesn’t mean we have to spend what we have. Cash is still KING. We are not stingy ..we are careful with our monies and how we handle them. I handle the monies at home. Oppa is a saver but im a super saver so im the one in charge. I planned our saving plans , insurances and monthly expenses. He can see an increase in his savings after i did his planning. Now im learning to cook more dishes and more healthier choices. Diet and life style is what caused alot of young people these days to fall sick or diagnosed with illnesses. Some of my clients are so young and already diagnosed with illnesses. Some are young parents. When i met them and did planning for them i also felt very heart pain. Take a break if you need to. Health is everything. Alot of joys this week also..some of my friends and clients gave birth. And i feel excited planning for the little ones. I dont know when but we are thinking of trying for kids maybe next year. Times flies…it is 430pm now and i need to pack my bag for my team trip to Kukup in JB. Im back from Busan ! 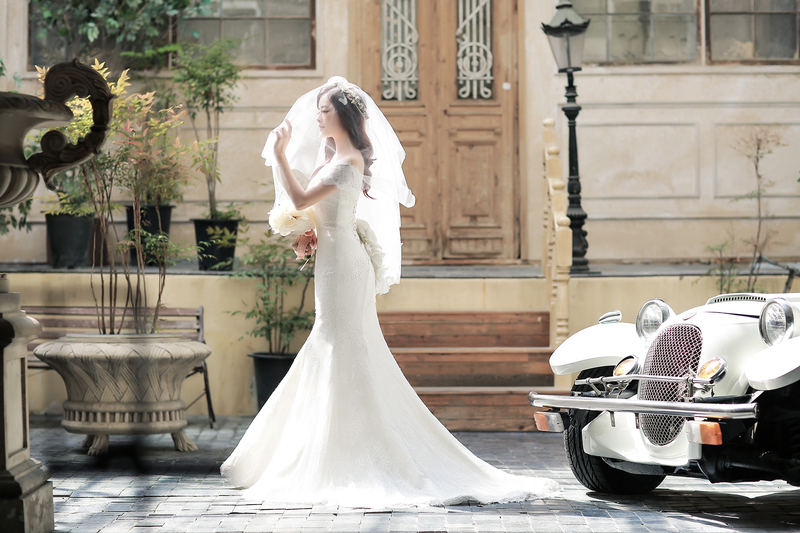 Busy bee preparing for the wedding , pre-wedd shoots and more. Received all the unedited pictures and now is shortlisting the pictures for editing and submit to the photographer. Massive update on my instagram account because i just got back on Sunday and haven’t got time to blog yet. Need to settle some work stuff before i find some spare time. Some new brands and MUST BUY lists to recommend too ! Last week was a busy and tiring week. And also i am in the midst of preparing for my wedding. Quite busy these days because of work and also wedding prep. 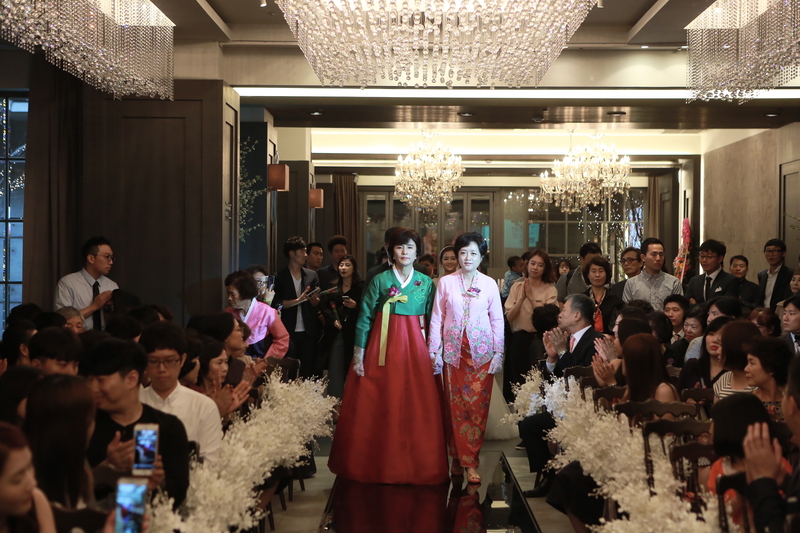 This coming April , i will be going there for my pre-wedding shoot , tailor made my hanbok , visit the showroom of our new house , confirm the interiors and decors/concept at our wedding hall etc. 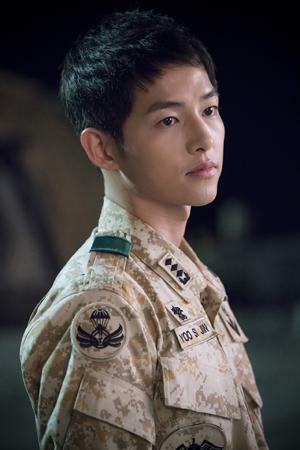 I am also caught up with the drama Descendants of the Sun. One thing that kept me busy and nuaing on the bed the past few weekends + Wed and Thurs. 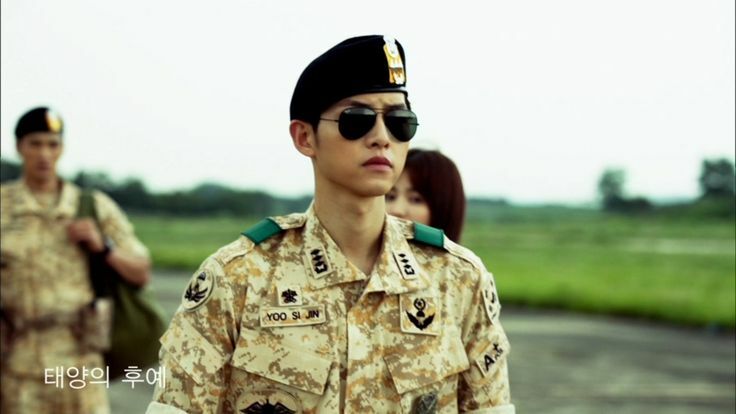 I realized he became more manly and masculine after he was discharged from the Korean army. Before that he was more of a pretty boy. Now that he is 31 years old…looks more masculine. My face book page is flooded with his news and photos. Aww so handsome and charming….~ He is having a fan meet in Busan and hopefully it will be held when im there this month end. Mr Shin promised to bring me there ! 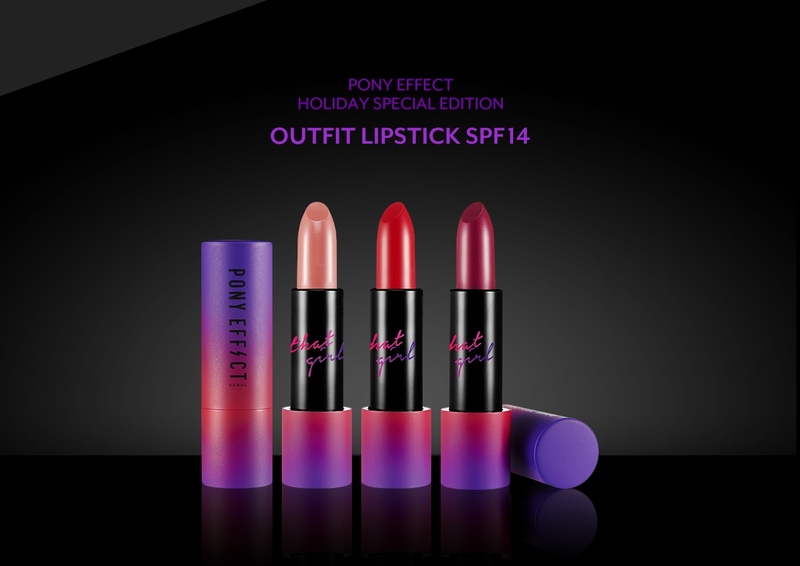 And also this coming trip im going to get some make up from Pony’s line – PONY EFFECT. Her makeup skill is really daebak. She can do an exact Taylor Swift look. And she is CL’s make up artist. No wonder CL looks better these days ! 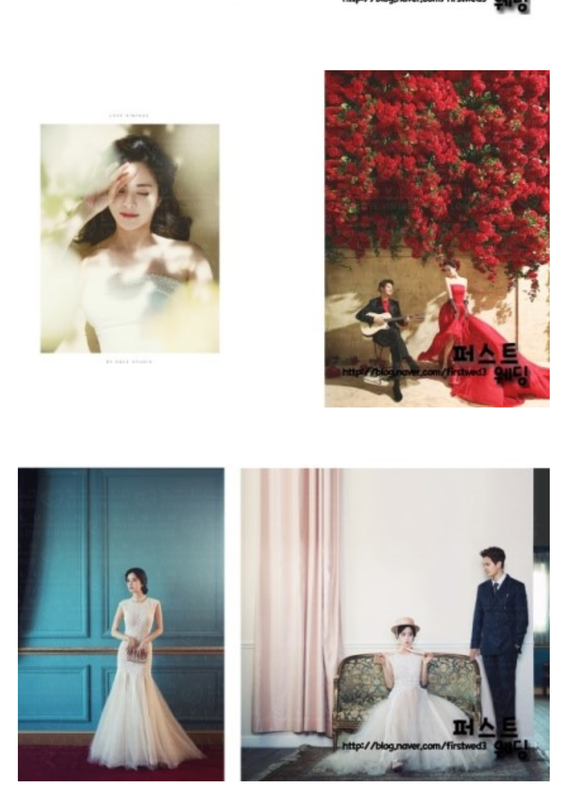 Looking at the samples of the photo studio im going to for my pre wedding ! Love it ! Looks very K-drama cover page or magazine style. But because the model is chio..haha if only i look like that lah. 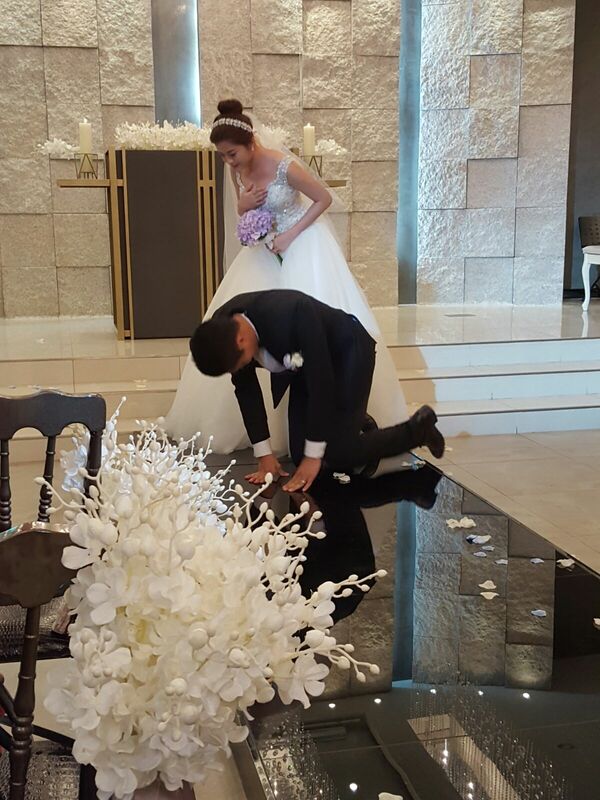 And now , im like listening to soooo many Korean ost and songs to find the perfect songs for my wedding. But i kinda “strayed away” . 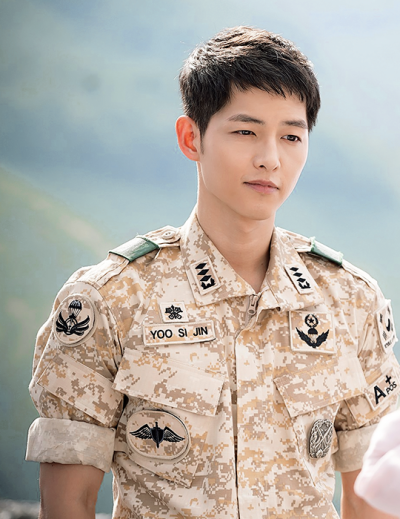 Instead of searching for my wedding songs , i went to listen to Descendants of the Sun’s OST. Of all the OSTs , here are my favourites from the drama. ENJOY ! Spring SALE is on ! Just bought this knit for KRW 19,000 to match with my white jeans and i realized i got soooo many pink knits. I also reazlied the tops i brought to my Taiwan trip back in Jan were all in PINK. Watching the Descendants of the Sun gave me alot of inspiration ( make up and hair colour ) for my pre-wedding shoot. I want to dye this exact same colour ! Same as Song Hye Kyo when i go to Korea in 3 weeks’ time. One of the reason why i MIA-ed for 2 weeks. I was down with a really bad eye infection. Pus was oozing out from my eyes and it somehow dried up and “encrusted” around my eyes. 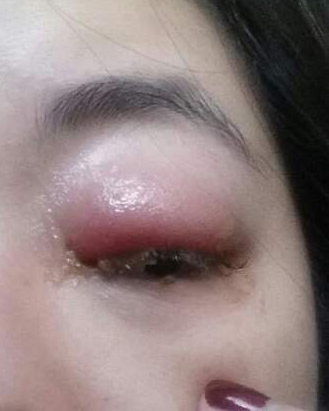 I thought i was tearing because of the inner lid infection but i was shock that i was unable to open my eyes and totally disgusted by this sight when i looked into the mirror. This picture already not bad liao. It was worst. So for a couple of days , my eyes was totally shut. I thought i was going blind okay ! 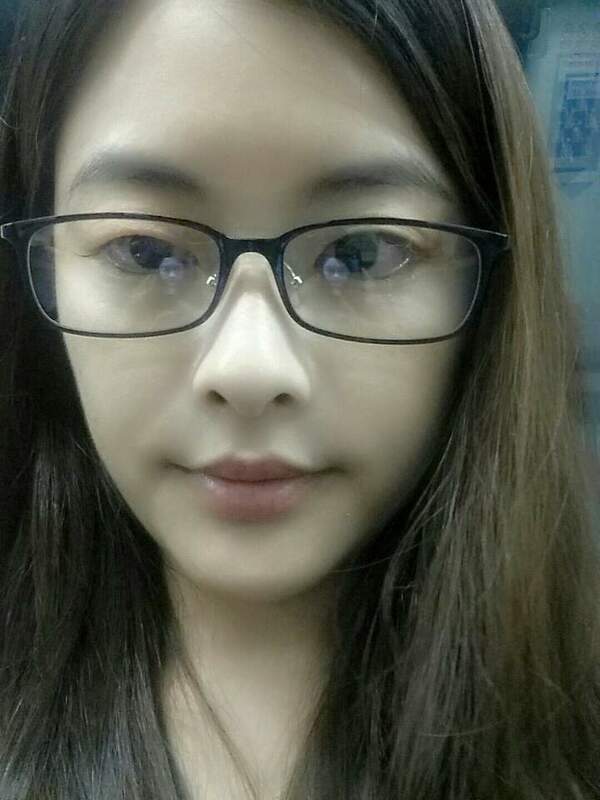 Got a cheap cheap specs to wear and cover the swollen eyes. This was a few days after taking antibiotics. Took 10 days to heal completely before i was down with a bad cold again. And if you are wondering who is handling Agneselle now ? Well , i have people taking care and running it for me now. You can enjoy 20% off NEW ARRIVALS now ! (enter code CNY20 to enjoy 20% off NEW ARRIVALS and SALE50 to enjoy 50% off SALE) . New items just added under SALES page few days ago too ! Body immune system was kinda low for 2 weeks. I just want a healthy 2016 ! I just saw alot of emails in peonykissblog@gmail.com inbox and i will reply them before end of the week. Saw alot of queries on the jackets i bought and also places to go in Korea. I will answer them properly so it may take a while to reply. 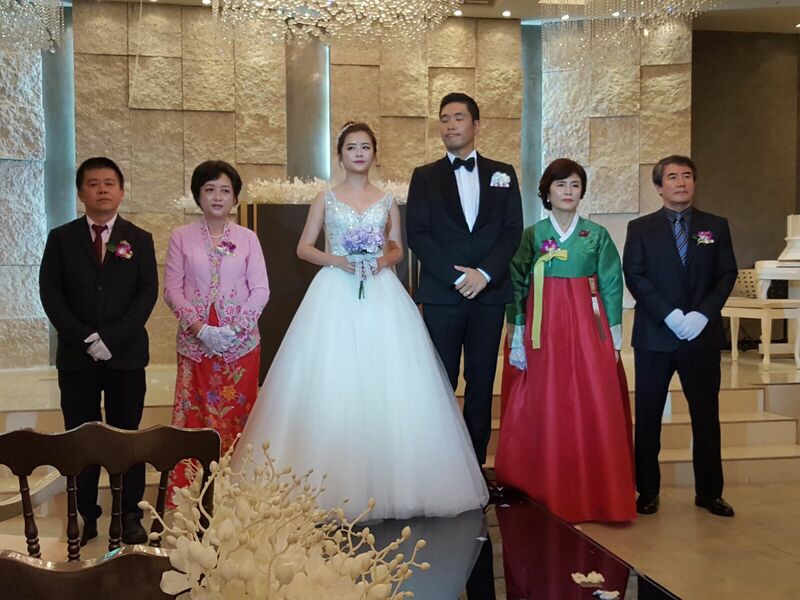 The wedding day is kinda fixed on 8th October in Busan. 08.10.16. 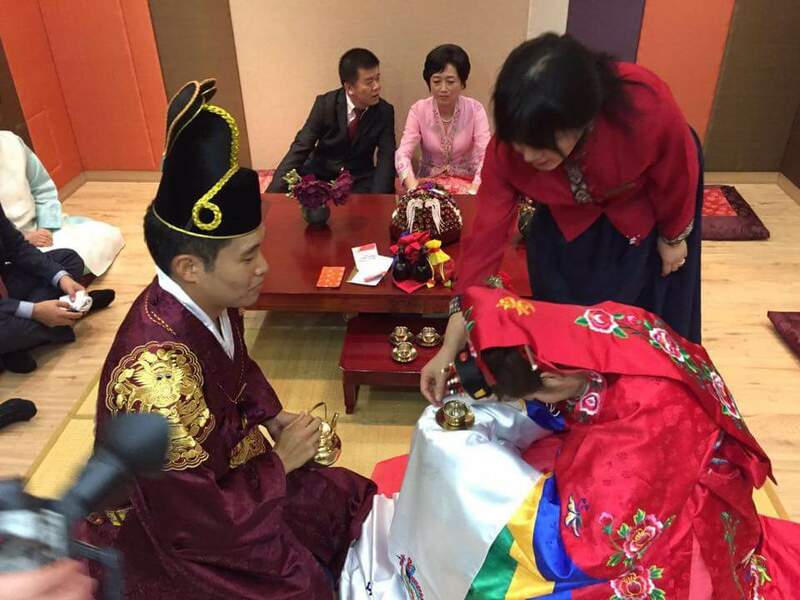 So this coming spring , im going there for my wedding shoot and make my hanbok. I am also arranging for my brother to take his wedding pictures there. 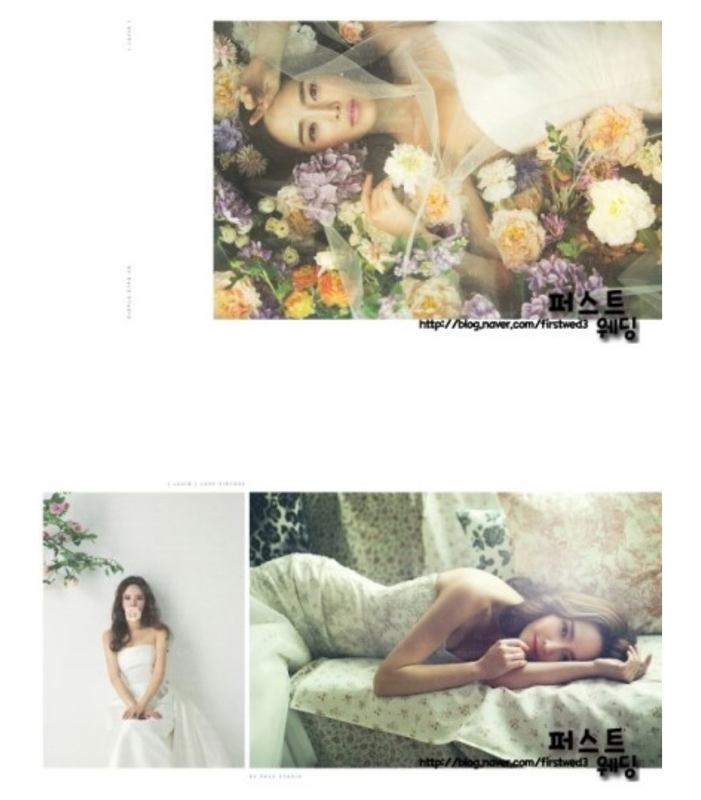 Im now becoming a Korea photoshoot wedding planner soon lol. Planning and arranging for photoshoots and proposals for alot of my friends or family member now. 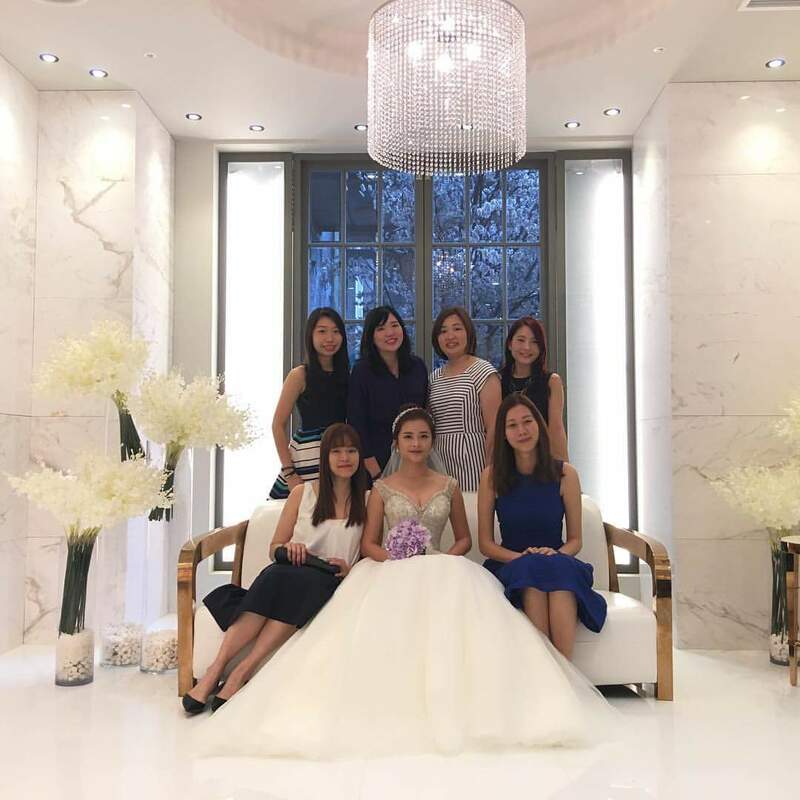 It is cheaper than going through bridal studios in SG. You save at least 50% lol but firstly you need to know the language and it is easier to communicate this way. Studios that target foreigners only tend to be a little more expensive. It is better if you have a local to arrange for you instead. 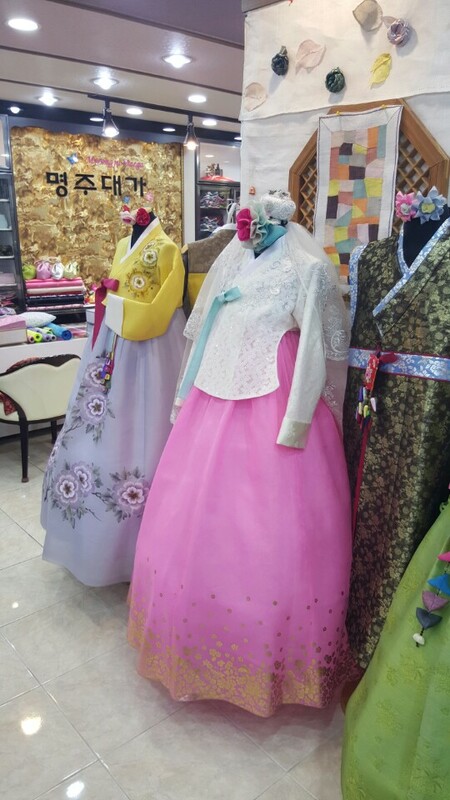 We were thinking of hanbok wedding dress which is more unique. East west fushion with embroidery details. Shall go see see look look this coming trip. 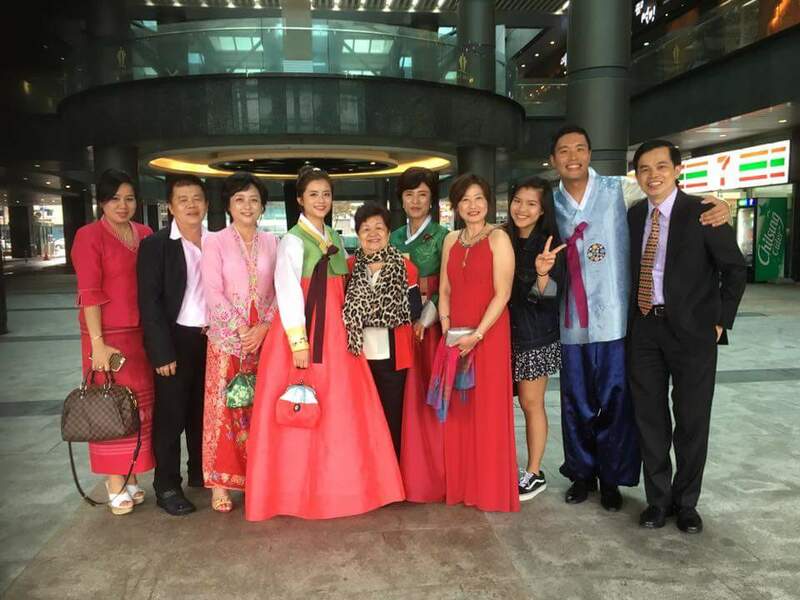 My new family in Korea. 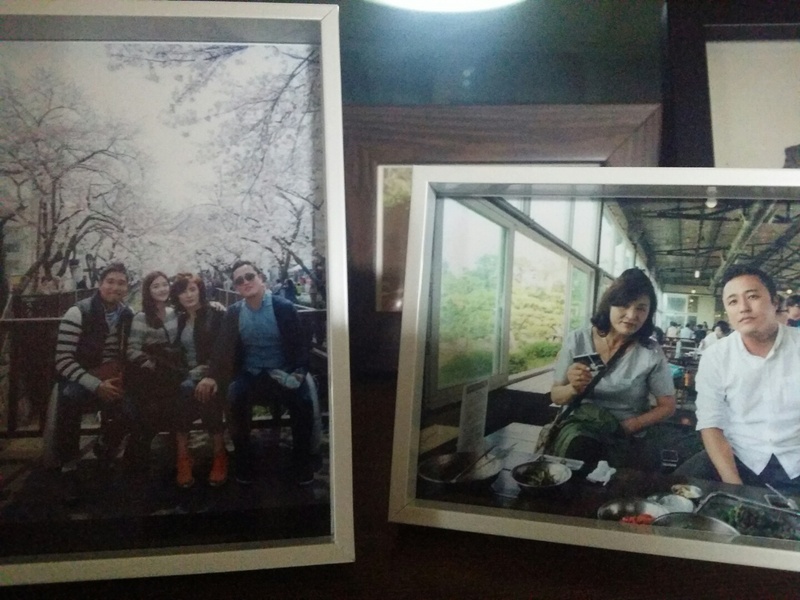 Jinjae oppa printed the pictures and put it at home. My fiance , his brother and his mother. 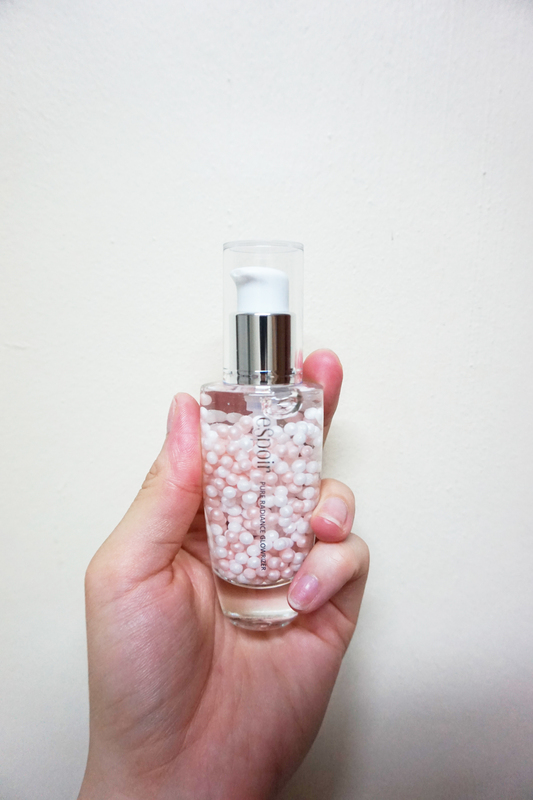 I have more good news and K-beauty to share next post ! 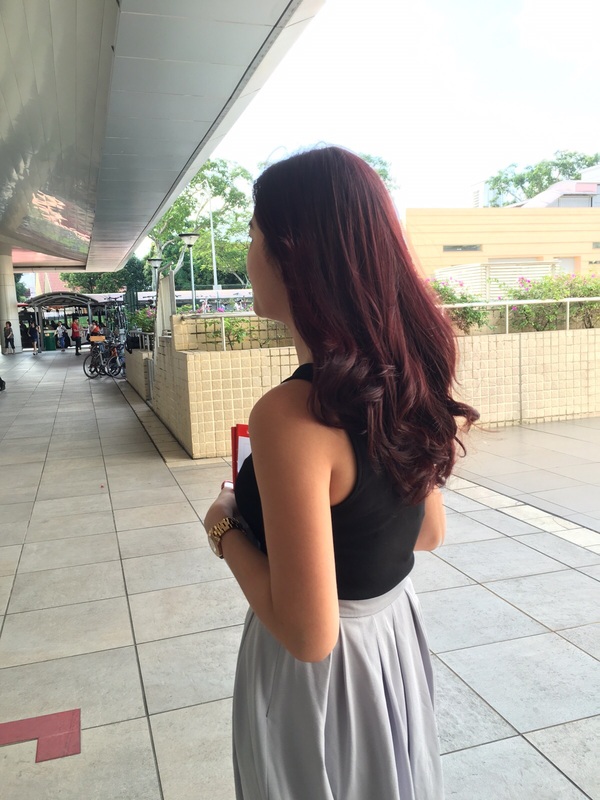 CNY is coming and i had my new hair colour done with Joanne. She is really attentive and attend to me from the start till the end even washing my hair. 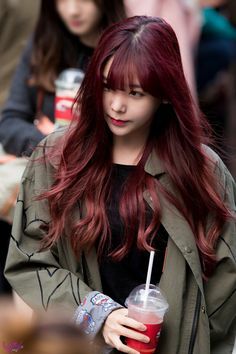 I wanted something abit reddish + violet + dark brown that doesn’t fade to orangey or yellowish tone due to the nature of my work ( i have to look presentable ) . Also something a little bit violet. So she mixed these 2 colours for me and i really love it !!! All my colleagues and friends said the colour is very nice and even asked what colour is it. 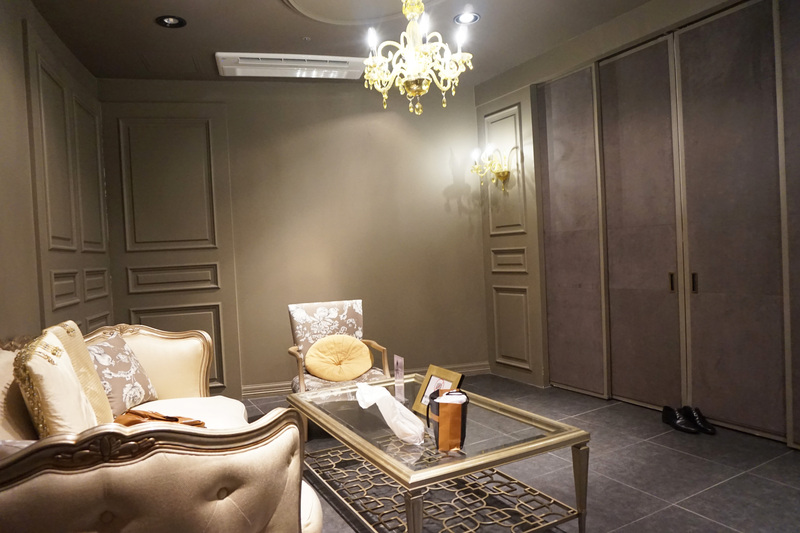 The salon is located at Chevron house so it is convenient for those who work at Raffles place. And also if you have any company events or important client meetings you can find her to set your hair. She starts early morning because some bankers find her to wash , below and set their hair before work ( really salute to them..can wake up so early to have their done ). You can contact Joanne at 9839 1084 and mention my name to enjoy discounts. Actually i bought quite abit of winter/spring coats , knits and beanies from the korean site for my taiwan trip. Im going to Cingjing and didn’t expect it to be -3 degrees celsius. Luckily , i bought fleece and fur lined leggings. Why i like to buy from Korean site is because 1) Affordable 2) Keep my warm 3) Light weight 4) Chic designs that never run out of style. The trick to buying from Korean site is never look at how good is it on the model. What looks good on model doesn’t mean it will look good on you. Their models look like dolls ( whether is it natural or plastic surgery i dont know ). Same goes to online shopping in SG. 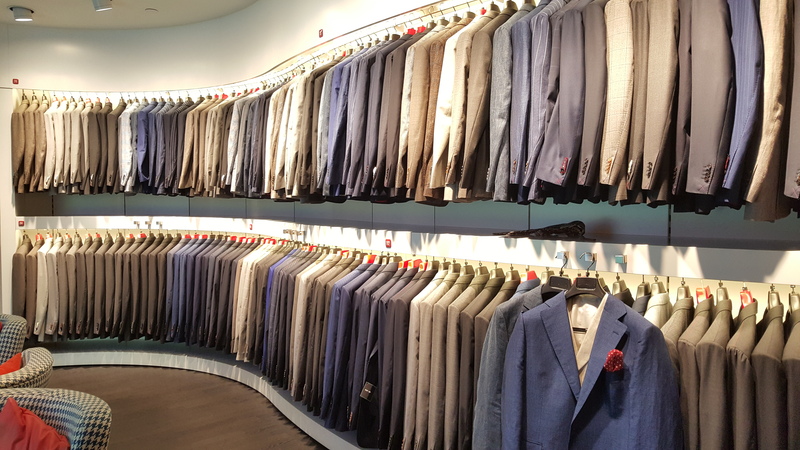 Usually i will take hours to shop because i really think and imagine how it will look like on me and how can i pair it with what i have.I also buy neutral or pastel colours because it is easier to match. 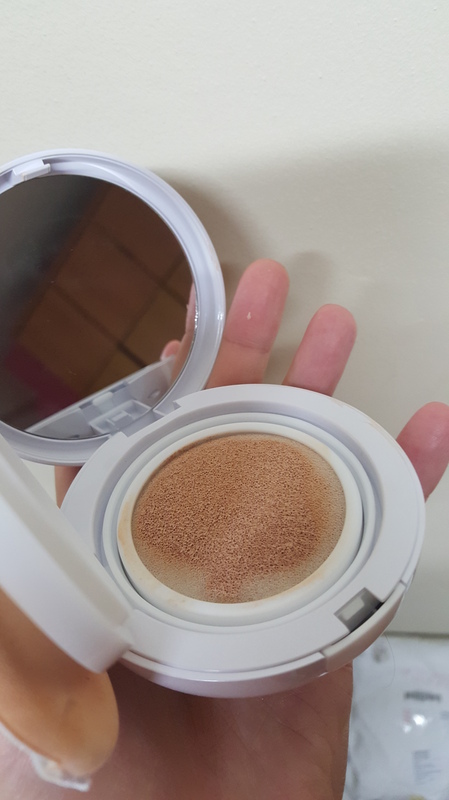 Remember the Espoir primer i blogged about 2 months ago ? I really love it. 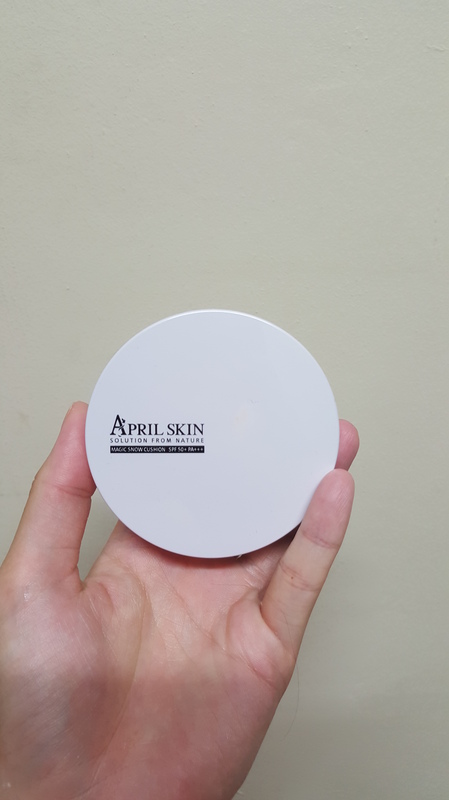 Very moisturizing and good for my Taiwan trip because it is winter there now. If you are looking for a primer that moisturizes your skin and gives you that glow , this is the right one ! I prefer this to the Hera one because this one contains essences and more moisturizing for me . Before i end this post , i wanna talk about animal cruelty and abuse. It is very saddening to know how some people can be SO EVIL HEARTED ! I hope karma get to this person who did this horrible and inhumane thing to this dog. Who can be so evil to trick it to the forest area and tie it to the tree. The dog was fighting for its life by barking and whining to get help and attention. 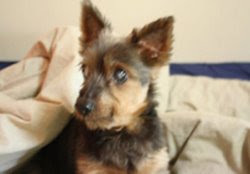 I emailed to enquire on how can i chip in to its medical fees and before i could even contribute , the dog has passed away. I really don’t understand how can someone be so evil to do that to the dog. May this little baby rest in peace. Really angry to read this. If the person who did that is reading this post..KARMA will come to you !